Some WooCommerce stores need a way for customers to set priorities when placing an order. By entering a number for each product before adding to the cart, they can indicate how you should prioritize their choices. For example, a customer might be selecting a selection of similar items without knowing which are available. You will ship a product to them based on the priorities they have entered against each item. The best way to let customers order similar items and set priorities is to list the products in an order form style layout. This makes it easy for them to view multiple products alongside one another and choose their favourites. They can enter their priorities and add the selected products to the cart. The good news is that you can let your users prioritize by combining two easy-to-use plugins. 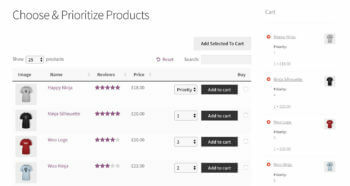 These are: WooCommerce Product Table and the official WooCommerce Product Add-Ons plugin. They’re both easy to set up, and you don’t need to add or edit any code. If you haven’t got to this stage yet, do it now. The WooCommerce documentation has an excellent Getting Started section. 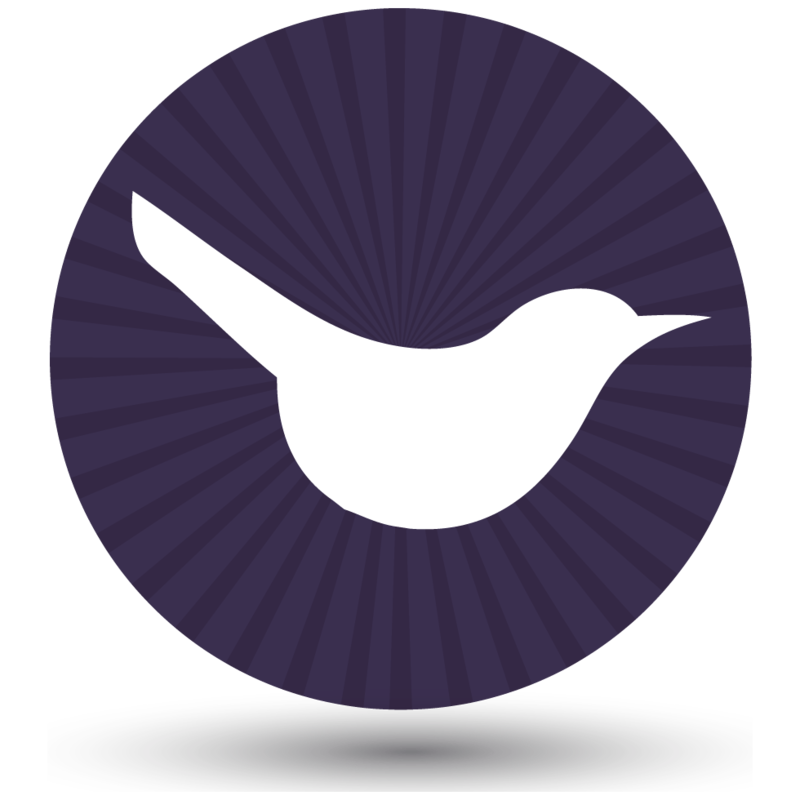 Get the WooCommerce Product Table plugin, and install it by following the instructions in the confirmation email. Choose how you’d like your product tables to work by setting the options on the plugin settings page. Check the page and you’ll see your products listed in a neat order form layout. However, there’s no way for customers to set priorities or prioritize their products yet. Keep reading to learn how to do this! Get the WooCommerce Product Add-Ons plugin, and follow the instructions to install it. The easiest way to set priorities is to go to Products > Global Add-Ons in the WordPress admin. This will add the priority options to all your products, or to a specific category or categories only. If you only want to allow priorities for a few products, then you can create add-ons individually on the Add/Edit Product pages for each product instead. Radio buttons – Adds a clickable circle for each priority. Customers can only choose 1 priority for each product. Select lists – Customers select the priority from a dropdown list of predefined priority options. Custom input (Only numbers) – Users can type a priority value into a box for each item. Set up your add-ons like the screenshot below, choosing any of these options. I used ‘Radio buttons’ in this example. Radio buttons and select boxes need multiple lines, as shown below. If you’re using the Text entry so that customers can enter a number in a box, you just need 1 line. Add clear instructions like ‘Set Priority (1-5)’. Finally, view the page with your product table order form. 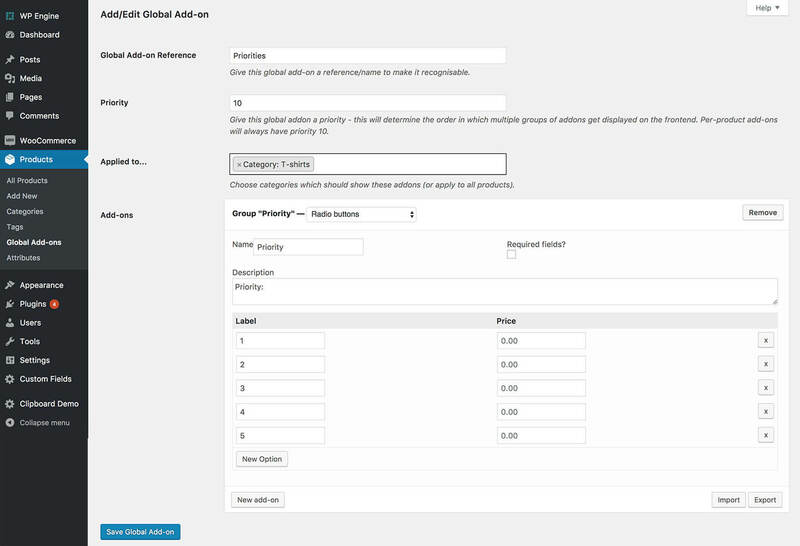 The priority options will appear in the add to cart column of your product table. If you’re happy with how the add-ons look in the table, then you can finish work and make yourself a cuppa. If not, quickly go to the Product Table plugin settings page (WooCommerce > Settings > Products > Product tables). Scroll to the add-on settings at the bottom of the page, and experiment with different combinations of vertical/horizontal add-ons. These two options display your priority options in different ways. Use trial and error until you find the right combination for your site. Can’t I just use variable products? 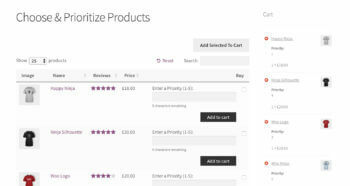 If you don’t want to use the WooCommerce Product Add-Ons plugin then you can collect priorities using normal product variations. I like add-ons because they’re easier to set up behind the scenes than variations, and you can collect priorities in different ways such as radio buttons and text entry boxes. However, you can use product variations to add a ‘Choose priority’ dropdown list which will appear in your product table order form, just like the ‘Select list’ add-on type. 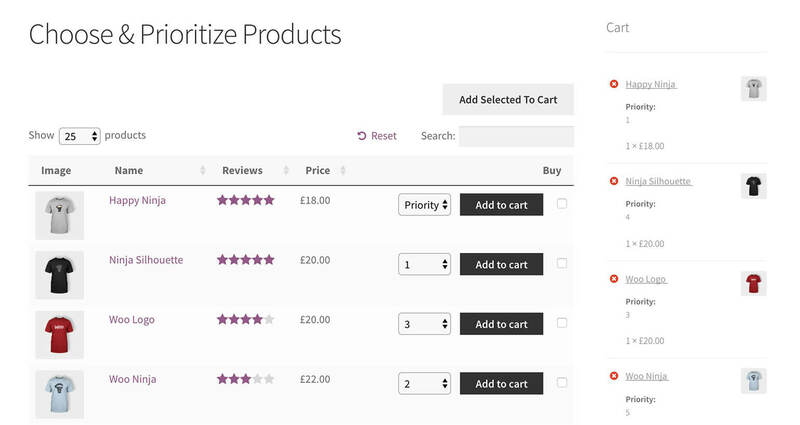 To add product variations, go to the Add/Edit Product page for each product. Add each priority option as an attribute, and then go to the variations tab and create variations based on these attributes. 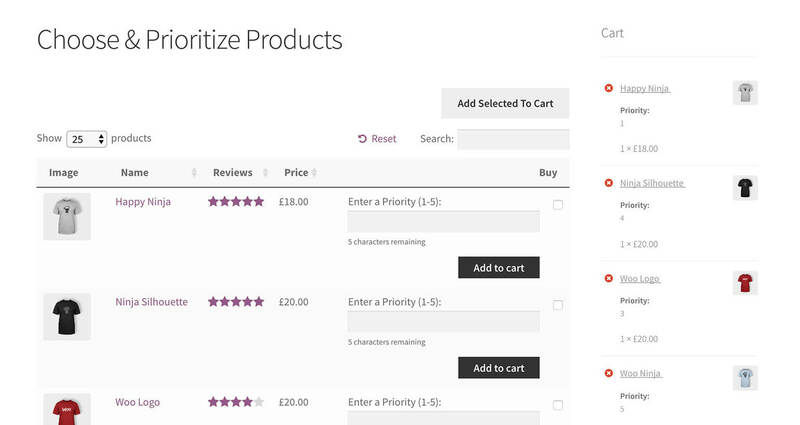 Now your customers can set priorities in WooCommerce! Using WooCommerce to set priorities is definitely a niche case, but lots of people need to do it. This tutorial will help you set up WooCommerce so that customers can choose and prioritize products before adding them to the cart.